DE WITTE LIETAER designs, manufactures and exports bed, bath, table and kitchen linen collections throughout the world. The company offers excellent value for money, the highest standards and a full service for hotel chains, restaurants, laundries, hospitals, governments, airlines and importers. DE WITTE LIETAER supplies consistent quality in accordance with the customer’s expectations, and delivers top-quality finished products.The company manages the entire supply chain and provides full technical and commercial support for customers. A full range of stock items and custom-made products is available. 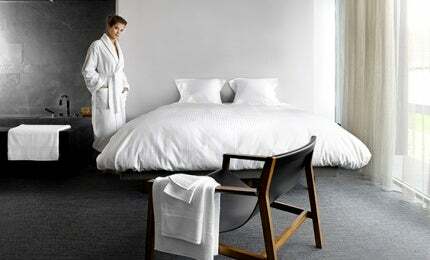 DE WITTE LIETAER offers hotel linen in a range of timeless, classic, sophisticated and contemporary designs. The bath linen collection includes towels in soft, luxurious, terry fabrics (between 400gsm and 700gsm) with matching bathrobes (between 380gsm and 420gsm) and bathmats (between 600gsm and 1,200gsm). The duvet covers, pillow cases, throws, bed skirts and bedding materials in the bed linen collection are available in different fabric qualities and finishes (between 130TC and 300TC), to match each client’s style and budget. DE WITTE LIETAER also offers a range of highly durable, professional kitchen towels, which are all lint-free and very absorbent. In addition, the mainly jacquard-woven table linen enhances diners’ gastronomical experience, and is complemented by a collection of tablecloths, napkins, placemats, and runners, as well as table protection and skirting. DE WITTE LIETAER manufactures table linen, customised kitchen and bath linen at its own production facilities. The company supplies flexible solutions for the manufacture of personalised bath, table and kitchen linen, and small series runs of these products. DE WITTE LIETAER provides a full service for the make-up of bed linen. Ready-made items are available in different versions held-in-stock. The company offers a wide range of cotton fabrics, polyester-cotton blends, as well as different thread counts and patterns. Many possibilities for tailor-made bed linen are available to match the customer’s precise requirements. The company’s entire range can be customised, with a minimum order quantity. Creative designers are on-hand to develop elegant and original collections that meet client specifications perfectly. R&D is paramount for DE WITTE LIETAER, as the company aims for maximum durability and performance of its products. Each item is a result of the combination of technology, comfort and design.All products meet the strictest requirements and can be washed well in an industrial laundry. DE WITTE LIETAER is an established brand with a respected name in the world of textiles. Thanks to knowledge and expertise, the company has led the field in traditional Flemish linen since 1898. As a member of the French HDM textile holding, specialising in hospitality linen, DE WITTE LIETAER combines the strengths of different companies.